Cavallino GT1 Bluetooth speaker docks joins the Ferrari by Logic3 range | What Hi-Fi? Logic3 is expanding its Ferrari Collection range – it originally began with these headphones – by introducing the Cavallino GT1 Bluetooth speaker dock. 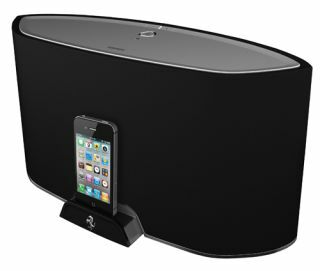 The dock is equipped with digital signal processing (DSP), a 2.1 speaker system including a 6.5in integrated subwoofer, and Bluetooth compatibility so users can stream music wirelessly from Android, Windows and Apple iOS devices. There's a free Ferrari by Logic3 control app available on iTunes that allows the acoustic settings on the dock to be altered, and gives full control of music from any iDevice. The app also features a selection of sounds, including that of four Ferrari GT cars, plus a clock display inspired by a Ferrari speedometer. Additional features include Class HD amplification, a claimed 250W (RMS) power output, remote control, video out, 3.5mm aux in and USB charging port. Costing £499, the Ferrari Cavallino GT1 dock is available from Ferrari's online store, Harrods and Selfridges. It joins the Scuderia FS1 dock which is already available for £496.